McFarlane NHL 30 on the horizon and it's a pretty good group that collectors can set their sights on. Leading the way is Mario Lemieux hoisting the Stanley Cup in his 1991-92 uniform. I have to say that the patch still looks great and the expression on “Super" Mario's face is perfect. That year #66 won the Conn Smythe for the second-consecutive year, becoming only the second player in NHL history to do so. 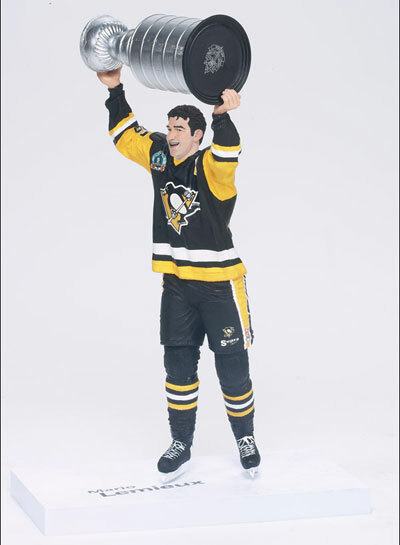 It's always a good idea to get a figure with the Cup (I love that the Maple Leaf is on the bottom) for the simple fact that you can take it out of the hands of Mario and place it in the hands of your favorite player. It's nostalgic to see Ryan Smyth back in his Edmonton Oilers sweater with the “A" on it. The Oilers drafted the well-traveled player way back in 1994. He played with the team until 2007. Now he's back, having a real bounce-back season. Edmonton fans will want this one for sure. Brian Gionta looks very tanned in his Habs sweater. He nearly scored 30 goals in Montreal the past few seasons, making him one of the team's best players. Since he's only 5-7 it's easy to fit this figure into the clamshell casing. Gionta is good player making his debut in McFarlane NHL 30. Detroit's Pavel Datsyuk looks like he is ready for action. His face shows determination just before he's about to win another face-off. He's won Stanley Cups, and seven NHL Awards (all Lady Byng and Selke) and he's continued to be a force in Detroit for the past decade. McFarlane NHL 30 marks his second figure and it's a great one. 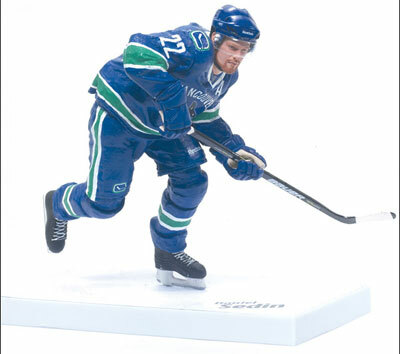 Daniel Sedin looks perfect. Even his figure looks as smooth as he is on the ice. This Vancouver juggernaut won the Art Ross and the Ted Lindsay awards last season. Last year, he had 104 points and this season he's already almost half-way there. This is his third figure and something tells me there are more in his future. This is his 11th season and he already has 700 points. 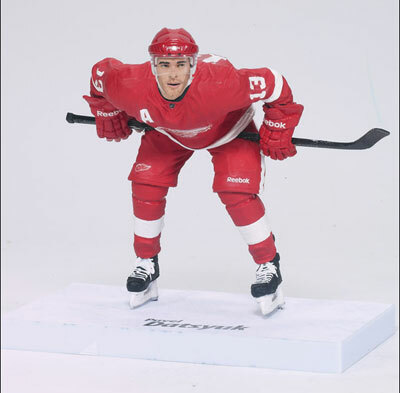 Slated to hit stores later this month, McFarlane NHL 30 is a very strong set.